Spending a day fishing a farm pond or small lake is a most enjoyable experience. No jet skis, houseboats or cruisers. 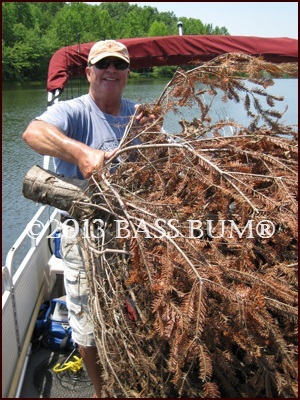 Note also, that some of the biggest bass taken every year are from farm ponds or small man-made lakes, especially if they’re fertile and well managed. North Carolina’s largemouth record for example is 16 pounds, 2 ounces and was caught in a pond! 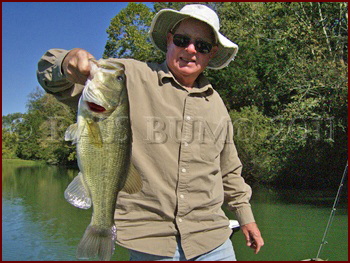 The bass are not usually “pressured” by a ga-zillion fisherman. You don’t need a boat but if you prefer a canoe, kayak or Jon boat works perfectly. You also can have a successful day with limited gear and even use the opportunity to learn the proper presentation of new lures. The natural bank habitat of these water bodies affords bass living in them a regular smorgasbord of forage and keeps them close to shore most of the time. However, just because pond and small lake bass are not the victims of heavy pressure that doesn’t mean they’re unaware. In fact, it’s quite the contrary. Since they are not accustomed to the sounds humans make they tend to be quite skittish. Startle them even by clunking up to the shore and they head for cover. Plus, they can see you if the water is fairly clear. So there is a need for stealth when fishing these little bass goldmines. Approach the pond or lake shore with soft steps as believe it or not these country pond bass can detect the steps of a clodhopper pounding up to make their first cast. When you move to another spot along the shore don’t walk directly along the bank. Back off a bit, 20-30 feet or so and then walk parallel to the bank till you get to your next position. Try to prevent your shadow from falling on the water in addition to being quite. This is a sure way to send them for cover. They have evolved to relate danger to moving shadows as many birds and other predators strike from the shore. First cast, use the quietest lure first. Something that’s topwater/sub-surface like an AC Shiner or Count Down Rapala or better yet a weightless fluke. Surface lures of most any kind excel in pond fishing. It can be safely said about pond depth that most small farm ponds, even larger small lakes, don’t have many, if any, deep areas. Depths that average 5-15 feet are the norm. Because of this pond bass are to a significant extent surface and edge oriented where they find a wide assortment of insects and other pond habitat creatures like frogs, mice, salamanders, rats and even little ducklings. Though there may also be healthy populations of crawfish and bream such as bluegills and minnows there will almost certainly not be any open-water baitfish like shad. The latter being what makes up a very significant percent of big lake bass. 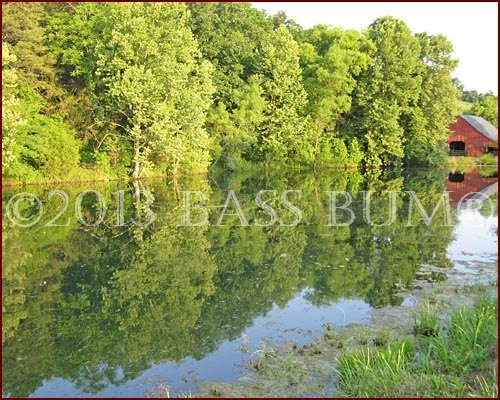 This forage base and the prevalent shallow water of ponds combined with their dominant edge habitat draw bass to spend most of their time right on or within 30 feet of the bank, where there is the most cover and forage. Cover and forage equals bass. 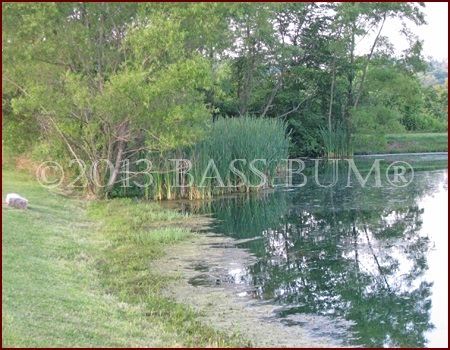 Pond cover comes in the form of aquatic grass, stumps, laydowns, sunken brush and shoreline reeds. Structure will be docks on small lakes but also small points offering shallow and deeper water, shallow pockets or the old stream bottom where the lake was created by damming up a stream. As in large lakes where deep drop-offs are bass magnets, old creek channel edges in small lakes and ponds of even 2-3 feet also attract bass. The dam that created a small lake is also structure and is where the deepest water will often be found. As well as big bass. Many small ponds and lakes are “seeded” by their owners with structure such as concrete blocks, tires, sections of culvert and both homemade and commercial artificial structures made from plastic buckets and tubing. Fish parallel to the bank. Don’t start off by casting to the center of the farm pond. They’re not going to be there. Maybe so in the heat of summertime, if that’s where the deepest water is found, or whenever the sun is high, but you won’t find them there as a matter of routine. Cast up close first and retrieve parallel to the bank. Then inch by inch move farther from the bank with each cast till you make a complete 180 degree fan cast pattern from bank to bank. Same applies if you’re in a vessel of some sort. Like fishing a bluff in a large lake pull up close to shore then cast parallel the shore so you keep your lure in the strike zone for as long as possible. If you hang 30-40 feet from shore and cast directly to it, unless you hit a bass in the head, you’re greatly reducing your chances of hooking up. An exception is where you find a stream entering the pond or any other avenue for fresh water to enter. Bass will often be hanging out right there. Is there a dock like the one at right? 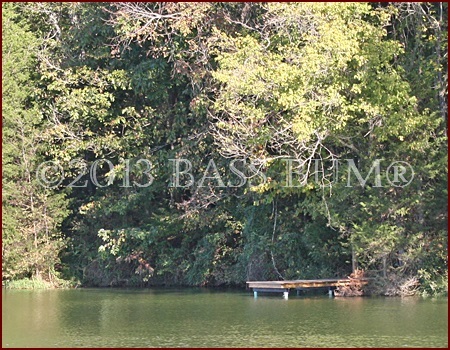 Great place to fish anytime but especially in summer when the water warms and the dock provides shade. Also, early morning and in the low light of early evening are optimum times in summer. 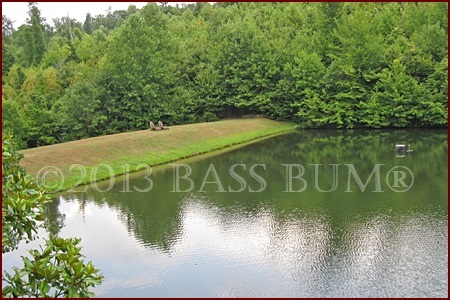 If you’re fishing a smaller man-made lake that’s got cover placed in in its center area then that’s different. Fish those spots, especially if there is some indicator like an isolated stick or marker poking out of the surface. Remember, bass or object oriented. When I fish big lakes like Dale Hollow I take everything I own by way of soft and hard lures plus up to ten rods. Of course they’ll be season specific. I know, many of you are thinking…”that guy’s crazy”. Hey, it’s the way I like to do it. That’s what’s great about bass fishing. Each of us can gear up the way we want to. There are no rules. However, when I fish small ponds or shallow lakes, say 10 to 60 acres, I’ll gear down. Spinning or casting spooled with 8-10lb monofilament or fluorocarbon line. Want to know some of the finer points of pond fishing and fishing small lakes? Follow these links. What lures are the best pond bass fishing lures?